Death Valley is already a quite remote location, but within Death Valley there is an even more solitary spot, called „The Racetrack Playa“. From Stovepipe Wells, quite in the center of Death Valley, you drive an hour north to the Ubehebe Crater. Here the true adventure starts: a dirt road with sharp and tire killing rocks takes you south into a secluded valley. Depending on road conditions, the journey from the crater to “The Racetrack Playa” can take easily 4 hours (own experience – and this is just one way!). If you are lucky, and the road was recently prepared, you could also make it in just 2 hours. In any case: do not try this trip with a normal rental car! You need a high clearance car and very robust tires. The Park Rangers told me that they have to rescue frequently tourists that got a flat tire with their rental car. And check your car rental contract: you typically lose all your insurance on a rental car, as soon as you drive on unpaved roads. Plus, there is absolutely no signal for your mobile phone in most of the journey. So if you are willing to dare this 10 hour road trip, fill up your tank and take water and food for a couple of days. The price for all the effort is seeing something truly unique: the famous sliding rocks that leave tracks on the Racetrack Playa. The Playa is a dry lake which was formed over thousands of years, when seldom rain washed muddy waters from the surrounding mountains into the valley. The water then dried to a perfectly flat surface, which is hard like cement. 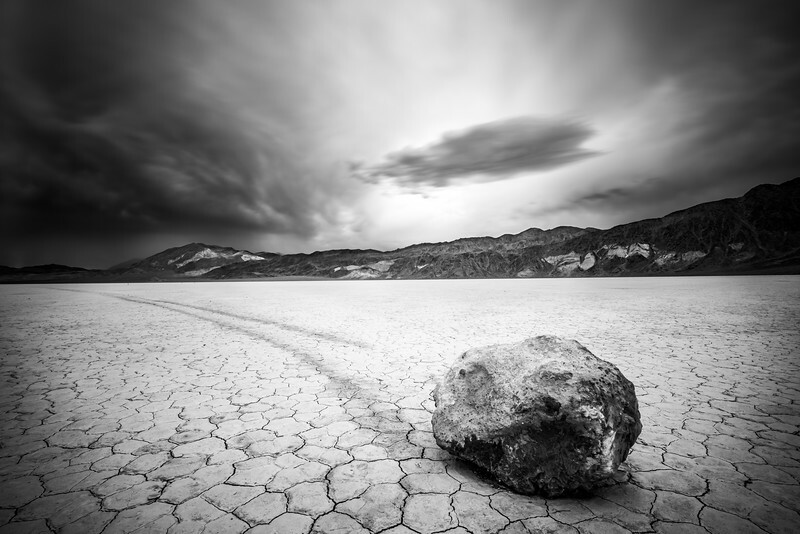 Along with the waters sometimes big rocks were washed on Racetrack Playa. In winter, with enough rain, the Playa becomes a shallow lake. During the night the water freezes, forming sheets of ice that also embed the rocks. In the morning, when temperatures rise above freezing point, the ice sheets breaks. If then the wind gets strong enough, the rocks start to sail on their “raft of ice”. When moving, the rocks leave traces in the surface of the Playa which became soft during the previous rains. Eventually the ice melts and the Playa’s surface becomes hard again, conserving the traces that the rocks left during their journey. For me, Racetrack Playa is a truly mystical and magnetic place. I’ll be back, no doubt.